Blues-rocker Walter Trout certainly has a lot to celebrate these days, with a new album, biography, and documentary all slated for release in the coming weeks as part of a long-planned celebration of Trout’s 25th year as a solo artist, which also includes the ongoing limited release of ten of his earlier albums in a deluxe vinyl series. But most of all, Trout is celebrating a new shot at life, following a successful Memorial Day liver transplant at Nebraska Medical Center (for which Trout’s music served as the operating room soundtrack). Reports from Walter’s wife and manager Marie are that he is recovering nicely from the surgery, after a life-threatening liver disease robbed Trout of much of his strength and about 100 pounds of his normally substantial frame over the past year. But that wasn’t enough to stop Trout from recording a new album during 2013 (with the guitarist recently commenting that the music “means more to me than ever before” since his sickness), even though the tone of that album no doubt changed drastically as a result of Trout’s circumstances. Death, it seems, may have come calling, but ultimately it was the blues that won out for Trout, and nothing makes that statement more strongly than his new album, which sees the blues-rocker singing and playing with a fierceness and desperation like there’s no tomorrow (an all-too-real possibility for Trout at times in recent months), particularly on such introspective and deeply personal tracks as the opening “Wastin’ Away” (“wishin’ I could do it over/ and I weep when I realize, that now I’m livin’ day to day/ and I feel like I’m wastin’ away”) and the dark “The Bottom of the River” (“I couldn’t see before me/ it was cloudy, it was cold/ and at the bottom of the river is where I met my soul”). 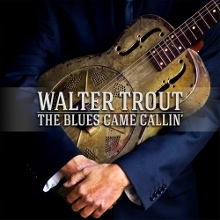 Out next week (in the U.S.) on the Provogue/Mascot Label Group, the Trout/Eric Corne-produced The Blues Came Callin’ features a dozen new tracks, including two swinging instrumentals that nicely balance the driving nature of such songs as “The World is Goin’ Crazy (And So Am I)”, the simmering grooves of “Hard Time”, and the rocking Moreland & Arbuckle-style aggressiveness of “Willie” that has Trout handling both guitar and harmonica while Deacon Jones adds some Hammond B3. The first of those instrumentals is one of two tracks featuring Trout’s former Bluesbreakers boss John Mayall, who in this instance, just sat himself at the piano and began playing spontaneously to create “Mayall’s Piano Boogie”, with the rest of the band quickly joining in. Mayall switches to B3 for the album’s rocking title track, a new blues-rock anthem to be sure, with other highlights including the passionate “Born in the City” and creeping closer “Nobody Moves Me Like You Do”, both featuring some growling vocals from Trout. Perhaps no song better expresses Trout’s outlook on the past year than “The Bottom of the River”, with its dark lyrics, muddy harp, and gritty Western tones. A metaphor for what Trout has gone through, the song captures the musician fighting death not only through his playing but with such lyrics as “Then I heard a voice inside me, and it sounded like a cry/ and I heard it scream so loudly, this ain’t your time to die” and “I made it to the surface, and I was gaspin’ for my breath/ and I cried in realization that I had cheated death/ I noticed so much beauty as I crawled up on the shore/ and that day I changed forever, from who I was before”. A cover of J.B. Lenoir’s “The Whale” keeps with the underwater theme for a spell, including a, well, whale or two of a guitar solo, but the album isn’t all dark: some Chuck Berry-like guitar riffs combine with Sasha Smith’s work on piano to create the swinging blues grooves of a “Take a Little Time” that, together with the aforementioned instrumentals “Mayall’s Piano Boogie” and “Tight Shoes”, goes a long way in helping to lighten the mood. Like his playing, Trout’s vocals here are surprisingly strong, only occasionally sounding more tired or nasal than usual as a result of his weakened state. An unquestionably impressive and strong offering, especially considering what he was going through, The Blues Came Callin’ finds Trout baring his soul both emotionally and musically, at the same adding another stellar piece of work in the guitarist’s nearly 50 year career devoted to the blues, which included stints in both Canned Heat and Mayall’s Bluesbreakers before Trout struck out on his own in 1989. If you’re interested in reading and/or hearing/seeing more on Trout while he’s recovering from his transplant, be sure to check out both his new official biography Rescued from Reality – The Life and Times of Walter Trout, co-written with British music journalist Henry Yates, and documentary of the same name as the album, with the film set to premiere at New York’s Iridium as part of a June 10th celebration of Trout that will also include performances from Joe Louis Walker, Jon Paris, and Jim Weider, backed by a house band of Rocky Athas (John Mayall), Scott Holt (Buddy Guy) and Jeff Simon (George Thorogood and The Destroyers). This entry was posted in Albums and tagged Joe Louis Walker, John Mayall, Walter Trout. Bookmark the permalink.